SolMateS thin film process equipment is based on pulsed laser ablation. A high power laser is used to evaporate material from a target. Subsequently the vaporized material condenses on a wafer or substrate. 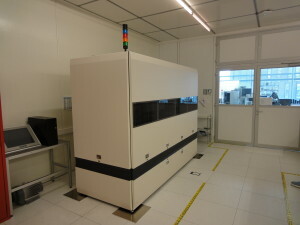 The current PiezoFlare platform allows deposition on wafers or substrates up to Ø200mm. The pulsed laser deposition method offers many advantages above other conventional techniques. In particular the one-to-one transfer of elements from target to substrate is highly beneficial for the deposition of multiple element material systems. The PiezoFlare 800 is a manually operated PLD system.This equipment can hold up to 4 different targets and can process any wafer or substrate size below a diameter of 200 mm (or 150 mm square). The source of the Pulsed Laser process is an 80 Watt Excimer laser with a fully automated beam delivery system. The tool has been designed for ease of maintenance with a high standard of reproducibility and stability.The reactor can process in a vacuum environment with a temperature ranging from 25 up to 800°C with background gasses as N2 or O2, and on request additional gasses are possible.